Pictures like this will certainly add to the ongoing rumour mill that LTTE leader Vellupillai Prabhakaran is still alive. I've been speaking to lots of people within the Tamil disapora and have been shocked by how many people are utterly convinced that the Tiger leader is safe and well. There's a general feeling amongst Tamils that you simply can't trust the Sri Lankan government to tell the truth. I've heard suggestions that he was never there in the first place. That the pictures of the dead body the SL government showed earlier this week were a look alike etc etc. Most disapassionate observers, experts and diplomats believe Prabhakaran is indeed dead but I can see why Tamils think otherwise. This picture was sent to me by a Sri Lankan friend of mine who told me that it has been buzzing through Tamil cyberspace all day. For all we know it's a fake, or a lookalike pretending to be Prabhakaran (he employed many lookalikes). It doesn't really matter either way. 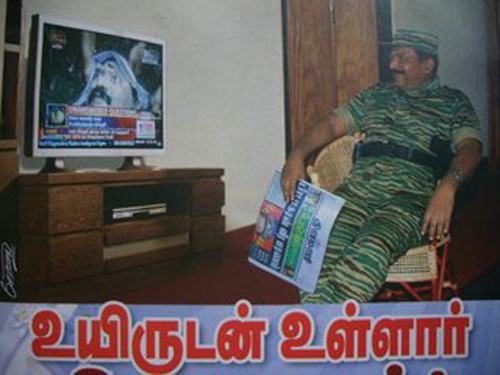 As long as Tamils believe Prabhakaran is still alive, they have something to rally around, something to cling on to. The war against the LTTE may have been won, but it'll take a long, long time before the peace is also won.